“Woefully inadequate” is how a new report from Caritas assesses the state of global funds reaching the most vulnerable people affected by climate change in the Pacific region. Despite large sums pledged at high-level international meetings, those most harmed are still being left behind. Communities in Oceania are working out ways to adapt to a changing planet. But their projects urgently need simpler processes to access funds. The Caritas State of the Environment for Oceania 2018 Report: Waters of Life, Oceans of Mercy tracks how people’s lives are being impacted by five key environmental issues. Alongside climate finance are coastal erosion and sea level rise; people’s access to food and water; extreme weather; and mining and intensive land-use. For people in Pacific island nations living at the very edge of existence, their reality of dealing with climate change makes them the “canary in the coal mine” – an early warning system for the rest of the planet. 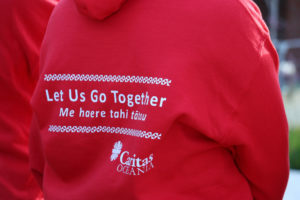 Caritas launched the report on 4 October. Shortly afterwards the Intergovernmental Panel on Climate Change (IPCC) released its Special Report on the impacts of global warming of 1.5°C above pre-industrial levels. The report urges the world to listen to Oceania at the UN climate conference in Poland this December (COP24). Caritas calls especially on New Zealand and Australia to act faster to increase climate finance, cut emissions and adapt to climate change. Eye-witness testimonies gathered by Caritas tell of increasing storm surges and king tides flooding houses and destroying crops with salt water. 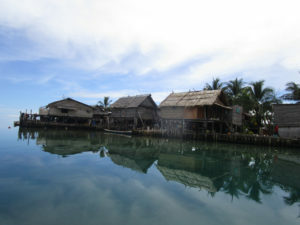 For many shore dwellers of the Pacific who are dependent on the ocean for survival, coastal erosion and rising sea levels are forcing them to leave the homes and land they have had for generations. Malia Masoe from Vaisigano River, Samoa, is one of 27,000 people in this river catchment whose homes and land are highly vulnerable to flooding. When storms hit, the drainage infrastructure cannot cope. To make things worse, nearly a third of vegetation has been lost to urban development in three years, which increases the risk of flooding. “When it rains for just one hour, water will come into the house,” says Malia. Cyclone Gita in February 2018 was the most powerful storm on record to hit Tonga. It destroyed over 4,500 houses, affecting 80 per cent of the population. But locals had been trained for emergencies so disaster plans sprang into action straightaway. 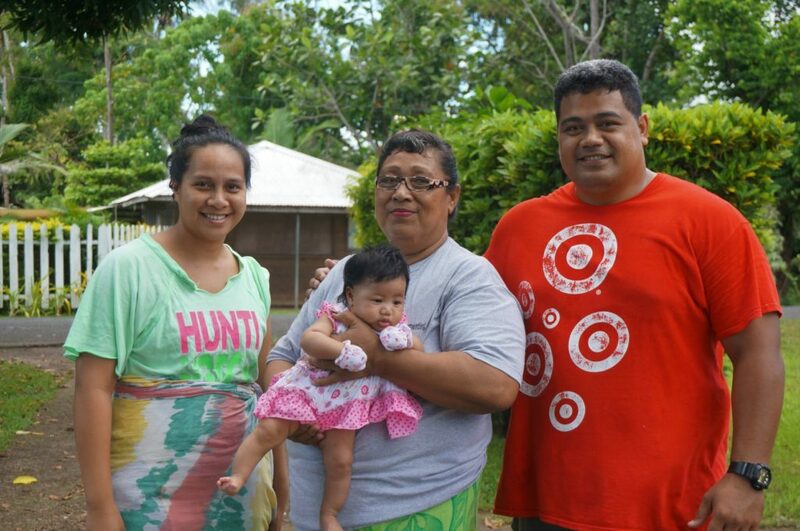 “We were able to mobilise very quickly to distribute urgently needed supplies,” says Amelia Ma’afu of Caritas Tonga. 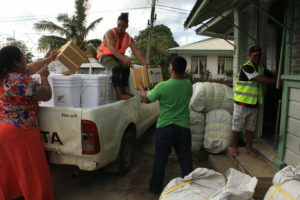 Tarpaulins, water containers and hygiene kits were ready in the stores. Pilot projects building sturdy houses proved effective and families came through unscathed. The report is witness to the pragmatic solutions that people are finding to build their resilience to climate change and protect their environment. “They’re not sitting around waiting for support,” says Amelia. A Caritas-supported clean energy project in the Solomon Islands has brought a 24-hour electricity supply in place of 3 hours of diesel-generated energy per day. In Fiji, a dam and reservoir system with hydroelectric generation and solar panels provides both fresh water and a sustainable power supply. This project has also planted 13,000 hardwood trees that will remove around 50,000 tonnes of CO2 from the atmosphere. At remote Mitimiti in Aotearoa New Zealand, a coastal care group is planting on the dunes to slow down erosion. “We must act and respond to the changes happening in our environment,” says group member Ana Bercich. Caritas is gathering local testimony of practices that are compounding the impact of severe weather events. Irresponsible mining, logging and land grabs for palm oil plantations are all endangering traditional food and water sources of local people. In Solosolo, Samoa, widespread sand removal by the construction industry is hitting rural families hard. It is causing flooding, pollution, loss of land and biodiversity. “Fishing was the only source of my earning,” says fisherman Sautupe Iosua. He has seen fish stocks decline drastically as sandmining has continued. He has no alternative livelihood, and now subsists on what little food he can grow. Waters of Life, Oceans of Mercy tells the human story of how climate change and abusive land use are affecting people dependent on the oceans, fresh water and healthy land for their survival and cultural identity. It shows how people are forging ahead with their own solutions, even as they struggle to access the funds they need. Often isolated and remote, these are communities bearing the brunt of climate change, and they need the world’s support and attention.